Discussion in 'Jokes and Games' started by marlingardener, Sep 24, 2018. Laly, Sjoerd, Growingpains and 2 others like this. Truer words have never been said ! Been raining for three days here,,6+ inches which we needed,, so a bit cooler ! Growingpains and Gail-Steman like this. @marlingardener wished we had better heat through winter...i've got the rads going for warmth. Almost jealous of your warmth, but we just had a killer summer here in southern Ontario and I am ready for fall! Henry Johnson and Growingpains like this. We had our first frost a couple of nights ago. Autumn has arrived in Scotland!! Oh dear.. both Eileen and MG... I want neither yet... we are raining and cool but not cold. the drive home tonight from the hospital was brutal with the rain and such poor paint markings along with all the construction and the previous lines that you can see in the rain but aren't part of the present road markings. horrid. After our humid Summer, I'm ready for Autumn. Just ordered ground cover seeds and I hope to get the garlic in the soil before first frost.Tomatoes are down to the last dozen or so. Although the fresh ones will be missed, memories of tomato/cheese on 12 grain toast will sustain me. 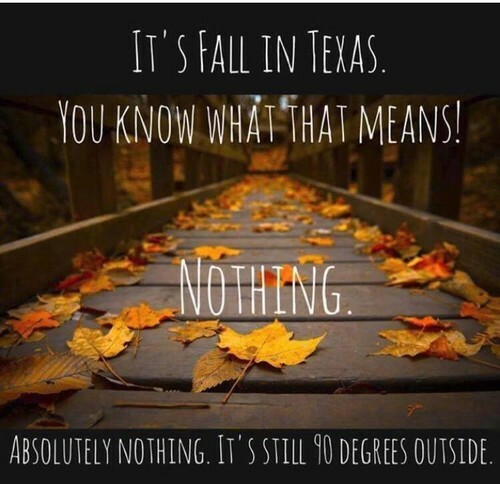 Yep, I am a born and raised Texan and remember being in school (way back in the dark ages when neither schools nor any other people occupied buildings had air conditioning)....just fans to blow the hot air from the open window to the farthest corners of the class room. Autumn happened in late November, if it happened at all, and winter was over by the middle of January. Spring was February and maybe a couple of weeks in March. Summer started in March or if you were very lucky, not until April and lasted through the end of October or longer. Most Halloween nights you did not have to worry about wearing a coat that meant no one could see your fantastic Halloween costume.... some years in January you got to actually wear the new coat you got for Christmas before you out grew it ... snow on the ground was "omg I have died and gone to heaven" and lasted one day....and yes schools were closed that day because we down here KNOW that we do not know how to drive in ice/snow. Gail-Steman and Growingpains like this. Toni, I will try to find this post in January when snow may be two feet deep and ice-covered roads keep me home. Short winters sound great, but the cold does kill off much of the garden pests. You paint a lovely childhood word picture of Halloween and your school days. Personally, I do like the changing seasons. I love the changing seasons...just wish changing to Summer was not one of them. With no winter weather to speak of for several years the bug population has multiplied many times, but thankfully we have a Lounge of Texas Spiny Lizards and a Lounge of Geckos inhabiting our back yard so they do a good job of keeping the bug population down. And we have a Passel of Opossums back there too and they love grubs, which later become June Bugs. Someone needs to send Mother Nature a memo! This lark started last week and the amount of trees by us is totally sick, besides conifers, and when the winds get up, that's hard work done for nothing. Oh Gail, that made me laugh, although I sympathize. When we lived in New York, our non-gardening next door neighbors got a spurt of yard activity and raked their leaves into a big pile. The wind came up and guess whose yard the leaves ended up in? I used to get the street leaves the lot cutting across the front garden whirl winding in the drive and omg opening the front door the lot would blow in...well hubby did the fencing around the front and Whippy that cut it down, so they would cut across the front of the property and end up in the corner of the fencing. Growingpains and marlingardener like this.